A s the 2010 Olympic Games are approaching, Vancouver is getting ready to welcome the world for two weeks of fun and excitement to celebrate sports. There are many of us who are extremely thrilled for the Olympics, but then there are some that oppose the games. 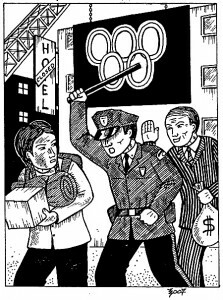 The reason why a large number of people are angry over the 2010 Olympics in Vancouver is because they are concerned about environmental destruction, the rights of low income or no income residents, lack of transparency and consultation in decision making, and development on indigenous land that has never been surrendered to Canada. For some people, the Olympics are a way to show off their athletic talents to the world for titles or medals but for some it’s considered criminalization. People who are victims of prejudice due to the 2010 Olympics in Vancouver voiced their views and experiences through websites and blogs on the internet. Some have taken sturdy steps to protest to let the government know that they are against these changes in favor of International Olympic Committee (IOC). Due to the Olympics, homelessness in Vancouver has increased from 1,000 to over 2,500 people. It is estimated by 2010, the number of homeless may be as high as 6,000. 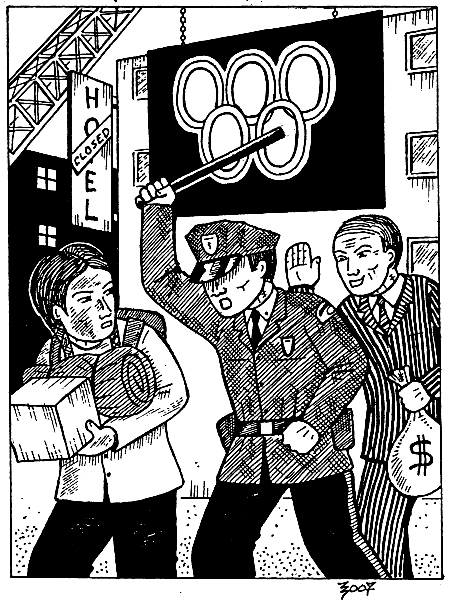 In order to ‘clean out’ the poor, Olympic host cities routinely begin a campaign to criminalize the poor. In Vancouver, the city has launched Project Civil City and new by-laws to criminalize begging for money, sleeping outdoors, etc. It has also included hundreds of thousands of dollars for increased private security (i.e., the Downtown Ambassadors). These measures fit with government plans to remove poor downtown residents to mental institutions, “detox centers” on former military bases, and the ‘fly-back’ scheme by police to return persons wanted on warrants in other provinces. Even though, these measures are taken to clean up the city for the world to see beautiful Vancouver, these critical measures are affecting the poor on many levels. They claim that they are being criminalized and removed from the streets with no other possibilities or places to go. It is a grave injustice solely for the purpose of putting on a happy front for the Olympics and for the world. The IOC’s main goal is to protect the Olympic brand. They do not want a homeless person outside to spoil a carefree dinner after a gold-medal Olympic event or for the media to take a wrong turn downtown and end up on the Eastside so they can expose Vancouver’s squalor to the world.